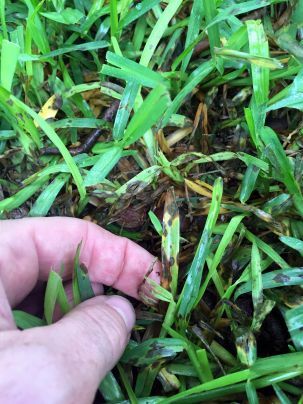 Gray leaf spot, Pyricularia grisea, is a fungal disease that most often attacks St. Augustine grass in our area. However, it can also infect bermudagrass, centipedegrass, rye and fescue. Gray leaf spot is often a problem during wet and humid spring weather. Lawns infected with gray leaf spot in spring often experience a flare up again in fall as temperatures cool. In St. Augustine lawns, you’ll first see small brown spots appear on the leaf blades. The spots then grow quickly into large oval tan to gray spots. The spots are bordered with purple or brown and surrounded by yellow. The entire leaf blade may then fade to yellow or tan. As the disease progresses, large areas of the lawn may apear scorched, as if they are suffering from drought stress. As with any fungal disease, water management is key to keeping it under control. Don’t overwater your lawn and limit watering to the early morning hours. Reduce thatch in the lawn with core aeration and soil bio-stimulants. Avoid overfertilizing with high-Nitrogen fertilizers and always mow your lawn at the proper height for the species.